The Toronto Film Festival wrapped up this weekend. And this year's big winner was 'The King's Speech.' 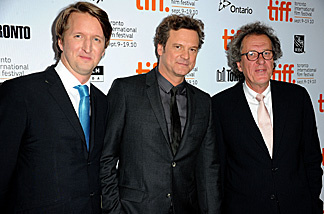 It stars Colin Firth as King George the sixth, who suffers from a speech impediment. With Madeleine to talk about the unofficial kick-off of Oscar season is Editor Sharon Waxman of TheWrap.com. She'll appear every Monday to talk about the business of Hollywood.